Build on our lots or yours!  If you want to build on one of our lots, or if you have land of your own and want to build your custom home, Best Homes can help make it happen. We will work with you on your custom home floor plan. Determine budget and financing needs that are acceptable to you and your lender. You may select from our library of plans, bring us your own floorplan or work with us to design a custom plan. All plans can be modified by our in-house draftsman in order to meet your needs and budget. Once you approve the floorplan and elevation, we will work up an estimated cost to build your home within 7 business days or less. This estimate will include generous allowances for key components of your home which include but not limited to: Site preparation work, appliances, lighting fixtures, plumbing fixtures, flooring surfaces, counter tops, cabinetry, doors and hardware, trim work and exterior features such as brick, stone and landscaping. We provide you with up to 8 hours with our interior decorator. She will be at your disposal to help you pick the colors, surfaces, fixtures, doors, brick and stone to make your home your style! We will begin construction as soon as your financing is in place and funds are available. Depending upon the size and complexity of your home, you should expect the home building process to take between six months and one year. Our construction manager will give you a better estimate upon completion of the construction meeting. After touch up items have been resolved and the final walk-thru has been completed, you will then be ready to close on your new home!